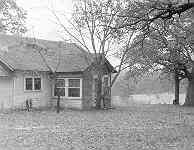 The “Old Farmhouse” was built in 1936, David Hendley was born in 1951, and the two came together in 1980. 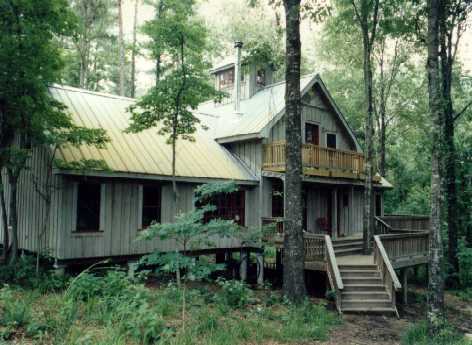 The old farmhouse was built by Jim Johnson, when he was in his 60’s. His relatives say that he cut the trees from the property, and transported them by horse wagon to the sawmill, to be made into lumber for the house. "I’m not sure he owned a tape measure, as the studs in the house seem to be placed with no regard to regular spacing," says David. Jim lived to be 101. By the time the Hendleys bought the place, it had been vacant for seven years and was in a sorry state due to disrepair and vandalism. It was listed in the real estate ad as a "handyman special", basically free with the purchase of the adjoining 74 acres of land. 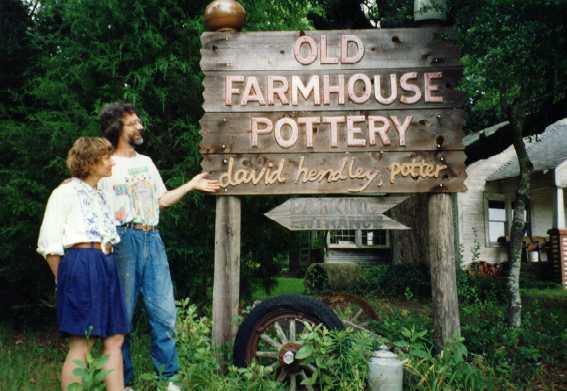 David and Karen remodeled the house to be a pottery shop in the early ‘80’s, by removing most of the interior walls to make two large rooms, and installing new plumbing, wiring, and floors. In the late ‘80’s they lived in the farmhouse while they built a new house nearby, and in the ‘90’s the exterior of the house was repaired and updated, to complete the transformation from abandoned farmhouse to pottery workshop and store. 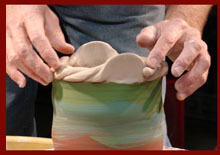 David first tried making pottery in 1972, when he registered for a pottery class in college. 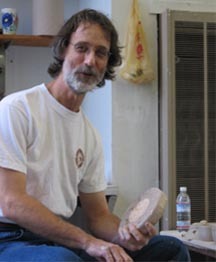 After only 8 weeks of the class with local potter and teacher Tracy Dotson, he had made up his mind to become a professional potter. "At this point," he says, "I was only one semester away from graduating from Trinity University in San Antonio, with a degree in Psychology, so I completed the degree but immediately turned to developing my pottery skills." 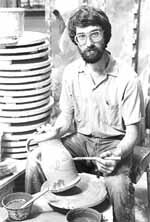 In 1973, he attended an intensive 8-week class at Big Creek Pottery in Davenport, California, studying with Bruce McDougal. 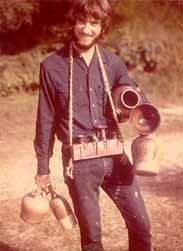 David returning from Big Creek Pottery in 1973. 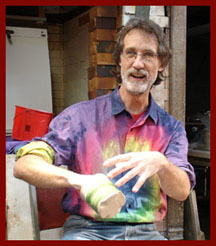 David enrolled in the University of North Texas in Denton in 1974, and took the art credits required to pursue a master’s degree in ceramics. 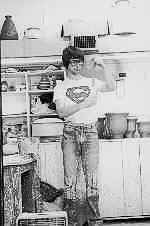 He earned an M. A. degree in ceramics from Texas Woman’s University (which is co-ed in the graduate school) in 1976, with the guidance of John Brough Miller. 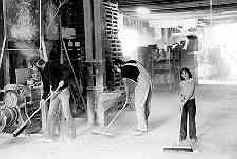 Working at the Clay Suppliers warehouse in 1978. 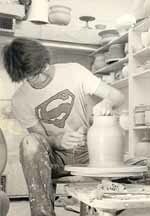 After graduation, David set up his first pottery studio at the Clay Suppliers warehouse in Dallas. John Williams ran his clay business in half of the warehouse, and offered potters a supportive and inexpensive place to make pottery by renting them space in the other half of the building. "I spent seven great years there, sharing the space with several other potters including Brent Matzen, Michael Obranovich, Merle Rosenbaum, Randy Brodnax, and Bruce Mayo." Cleaning up the warehouse for the Annual Christmas Open House Pottery Sale, 1980. 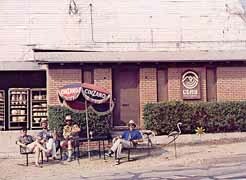 Taking it easy at "Club Clay Suppliers" in 1983. 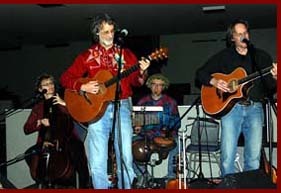 John Williams, David Hendley, Michael Obranovich, and Bruce Mayo. By 1984, the Hendleys had expanded to a family of four, with their son, Hans, and a daughter, Lenora, born in November. They made the move from Dallas to Maydelle, and spent the next several years designing and building their new home. The house is truly a "handmade house". David made all the doors, cabinets, moldings, and trim. It sits in the woods behind the pottery shop. 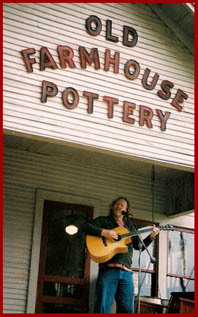 Once the new house was finished in 1990, Old Farmhouse Pottery was open for business. For those first years, David regularly traveled to art fairs to sell his pottery. 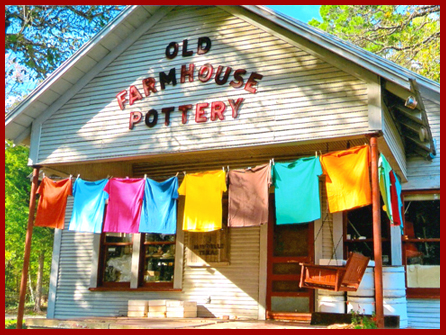 Now, as the shop has become more well-known, most of the pottery made at Old Farmhouse Pottery is sold right at the shop. The sign for the pottery shop is made with ceramic letters. 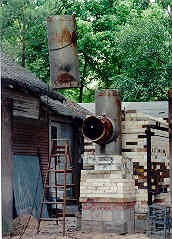 This kiln is the second one at Old Farmhouse Pottery, built in 1998. 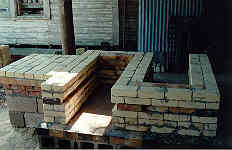 These photographs show the details of building the fireboxes and the chimney flue. 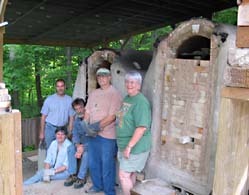 The chimney for the kiln came from a commercial incinerator, and each four-foot section weighs over 300 pounds. 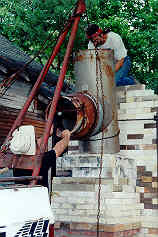 A friend offered the use of his boom-pole truck to install the chimney sections. 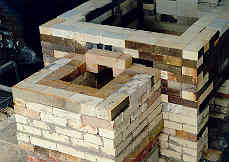 The final two sections of the chimney were home-cast, using a homemade castable refractory mixture. 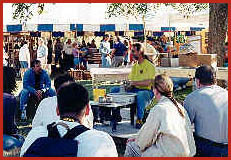 From 1990 to 1995 David traveled to about 10 art fairs a year, to display and sell his pottery. 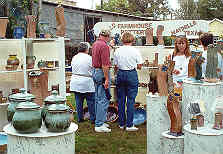 Now most of the pottery is sold at the shop, and The Texas Clay Festival in October is usually the only fair he attends. 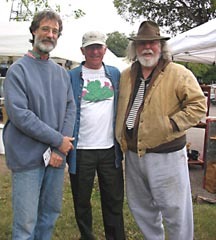 Here he is at the festival with friends and fellow potters John Williams and Randy Brodnax. 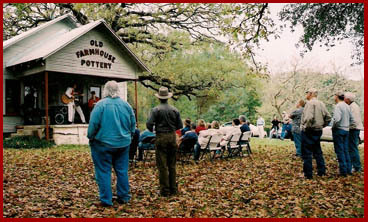 Every year, on the weekend before Thanksgiving, Old Farmhouse Pottery hosts an Open House. There is always lots of new pots and Karen's delicious cookies. 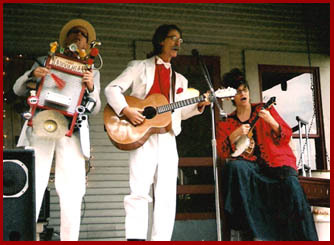 In 2003, Jealousy Motel (left) and Gordon (right) & Christie McLeod performed for an appreciative audience. Plain Folks and Jealousy Motel played for "Potstock 2004"
Pictures from November 21 & 22, 2009 featuring the "Old Farmhouse Pot-apult". For this "Cash for Chunkers" Open House, customers could trade in old factory-made pottery for new handmade pieces. The old pottery was sent out to pasture with the pot-apult! 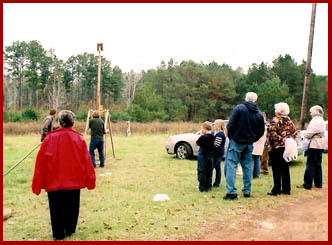 A crowd gathers for a launching with the pot-apult. 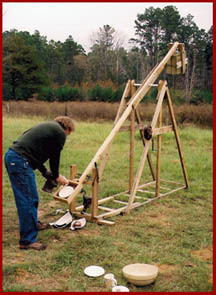 Randy Brown prepares the payload. 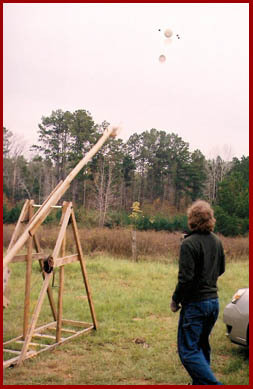 The launch lever is pulled. Another successful launch! This was a multiple-launch of several pieces of pottery. 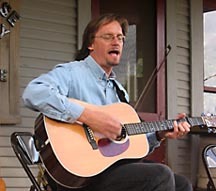 Randy Brown performs on the front porch. 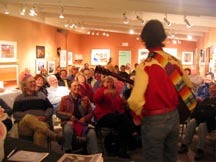 The crowd enjoys the music. The Wahooligans, John Smith, David Hendley, Dirje Smith. 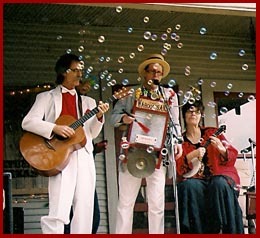 Bubbles magically appear during "Barbara Brown Soap". 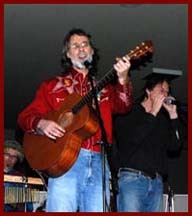 Dave Sherman & Dave Smith perform in the shop. Smitty the cocker spaniel gets his 15 seconds of fame. 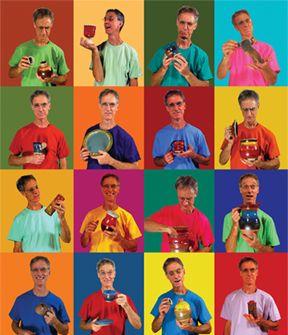 featured a colorful poster of David holding pots in colored tee shirts. The shirts became porch decorations at the Open House! 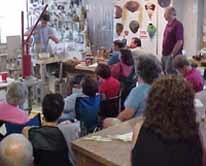 Several times a year David travels to present workshops demonstrating pottery techniques to schools and potter’s groups. 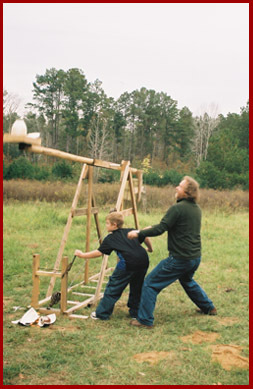 Throwing demonstration at his alma mater, St. Mark's School in Dallas, 1998. 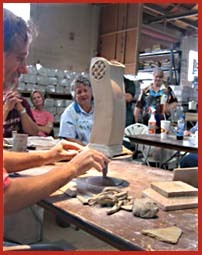 David returned for an extruding demonstration in 2007. 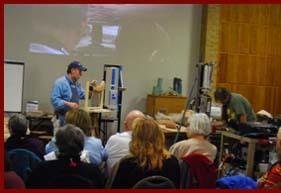 Demonstrating extruding techniques for Dannon Rhudy's classes at a workshop at Paris Junior College, 1999. 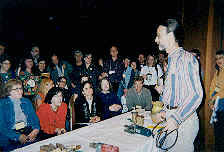 Die making at the "Tool Doctors" presentation at the NCECA Conference, 2000. 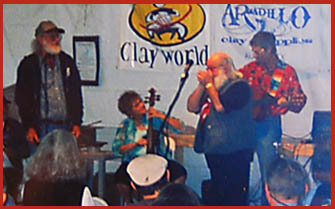 Demonstrating throwing at the Texas Clay Festival, Gruene, Texas, 2001. 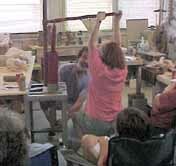 "Creative Extruding" workshop at the San Antonio Potters Guild, 2001. 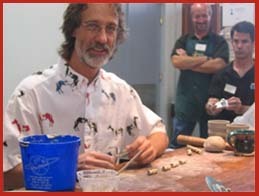 More "Creative Extruding" at the Texas Pottery & Sculpture Guild, Ft.Worth, 2002. 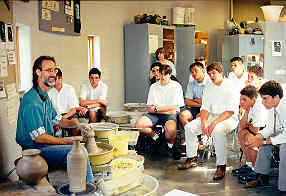 Demonstrating for Gary Hatcher's ceramics classes at the University of Texas at Tyler, 2003. 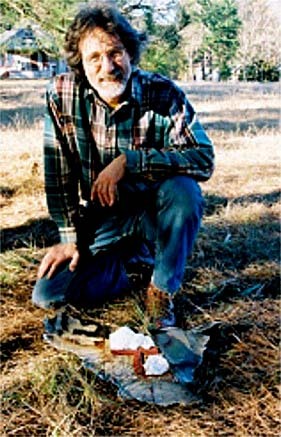 Council throwing workshop and conference, Mendocino, California, 2005. My view of the audience at the workshop! 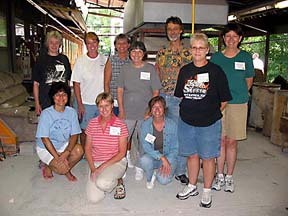 The class for the week-long "Tricks of the Trade" workshop at the Appalachian Center for Craft of Tennessee Tech University, July, 2005. 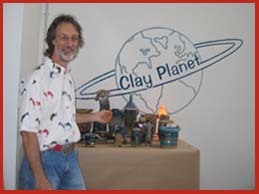 Scenes from another "Creative Extruding" workshop, at Clay Planet in San Jose, California, September, 2005. 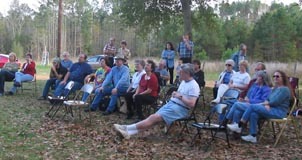 The workshop was sponsored by the Orchard Valley ceramics Arts Guild. 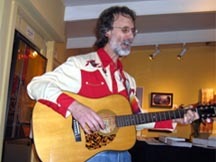 David was one of six presenters at the first all-extruding conference, and The Extrudinaires provided entertainment at the Friday evening dinner. 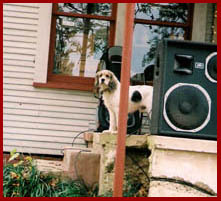 Demonstrating at the festival in 2001. 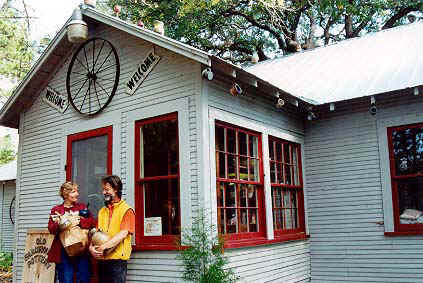 David has attended the Texas Clay Festival in Gruene, Texas every year since 1993. 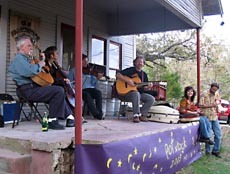 Right, David plays "The Cobalt Blues" with Don Gallia, Dirje Smith, and Robin Hopper in 2008. On February 1, 2003 the Space Shuttle Columbia broke apart over Maydelle. There were hundreds of pieces of debris in the area, including at least 3 pieces in the yard around Old Farmhouse Pottery. This section of the Columbia landed right in front of the pottery shop. 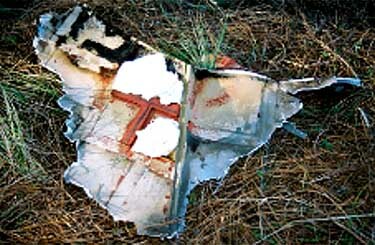 Notice the popped rivets, torn metal, and remains of the heat shield tiles. Hopefully some of these pieces will help determine the cause of the disaster. Six weeks after the Shuttle disaster, the NASA Recovery Team arrived at Old Farmhouse Pottery and searched every square foot of the property, looking for pieces of the spacecraft.